The Android OS has taken over every other smartphone OS in the recent past, and Google has put its step into the wearable category at the right time, with the Android Wear OS for smartwatches. The first two smart watches which are made available include the LG G Watch and Samsung Gear Live. While the Gear Live is a replica of the Gear 2 smartwatch which was powered by Tizen OS and already in the market, the LG G Watch is something new and available earlier than any other smartwatch with Android Wear OS. Coming with a very cheap looking rubbery strap, the LG G Watch doesn’t impress on the first look. The watch part is good though, but when you look at it as a complete package, the awe-inspiring factor is missing. The LG G Watch is light in weight, and the rectangular watch face doesn’t look bad at all. The display is 1.65-inch with the resolution of 280×280 pixels, and it’s the IPS LCD display which looks quite neat, putting out the colors pretty well and we even tried it under sunlight, where the brightness is quite appreciable. 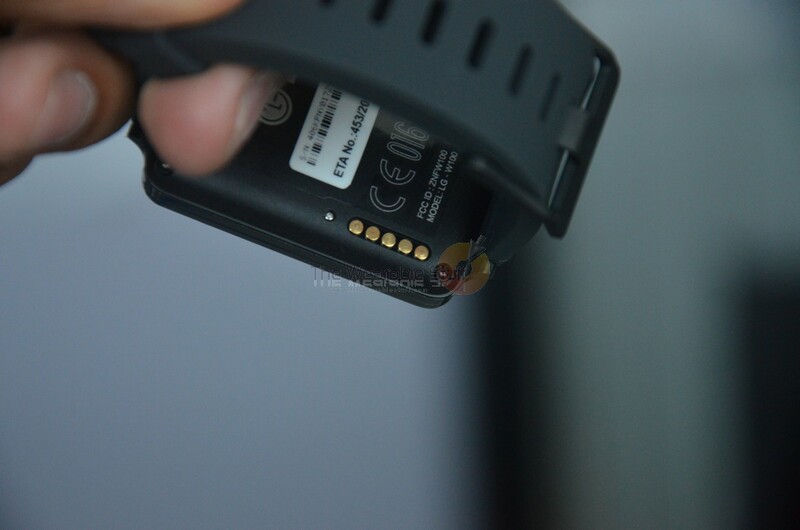 The silicone strap of the LG G Watch, which is the worst part, can be replaced by any strap with the 22mm width one, so we feel that’s at least something good for those who don’t feel anything wrong in spending a few more bucks to buy a decent looking strap for this. Getting into the OS, firstly the syncing between Android Wear and Android OS of the smartphone makes it possible to use the smartwatch. But that’s what the G Watch is all about. You are welcomed by the home screen that shows the time and whatever notifications you have, which are all shown just like cards are shown in Google Now. The good thing is that you can easily swipe them away to close, and the watch would show them accordingly if at all it seems important later. For example, the thing I noticed during the entire day of usage is that, when there was no notification shown, the bottom part of the screen shows the weather information, which I never chose to show. It is good, because it doesn’t annoy by showing up on the entire screen, except when you choose to open it by yourself. Whatever is the notification on your Android smartphone (remember we can connect the watch with only phone running Android 4.3 and later), that simply gets replicated on the smartwatch and you get a gentle vibrate for that. I could easily view the entire notification, the facebook comment and message but can not do anything about it, except for triggering it to open the app in the smartphone. That’s understandable, and that is what Android Wear OS is all about. Ok Google – this is what makes everything possible. The Google Now has to be activated on your smartphone, and once it is, you just will have to say “Ok Google” and say your command. I was quite impressed with the way the G Watch was able to listen to my command from a distance of few feet. No comments on the Google Voice functionality though, because it is already a well-known feature for Android. I could do quite a lot of stuff initially, like changing the watch face, take down notes, check the number of steps I walked, adjust brightness, toggling Aeroplane mode, and I tried installing a few apps on the Android phone for the Android Wear OS, and they were all working pretty well. The major issue with the LG G Watch was the battery life. After an entire day of usage, it was around 20 hours of continuous sync between the watch and phone, all notifications active and some standard usage, when the battery in the watch went down to zero. Overall, the LG G Watch for the first-time usage has been pretty good. It isn’t the worst in design, and the Android Wear OS is very much promising. I’ll be doing a complete review of the smartwatch in a few days and only then, can tell you how good or bad it is, and whether it is worth spending on it. If you wanted to wait and try to get the Samsung Gear Live, check out the LG G Watch Vs Samsung Gear Live comparison before you make a decision.